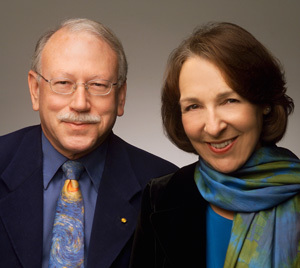 A new book by the husband-and-wife team of Nancy Ellen Abrams and Joel Primack, distinguished professor of physics at UC Santa Cruz, explores the cultural and social implications of the modern scientific understanding of the universe. 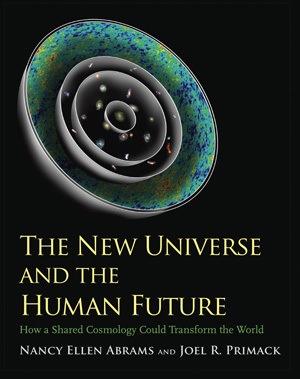 The New Universe and the Human Future, published by Yale University Press, is based on the Terry Lectures that the authors gave at Yale in October 2009. Subtitled How a Shared Cosmology Could Transform the World, the book advances a view of humanity's place in the cosmos that offers new insights into seemingly intractable global problems such as climate change and unsustainable growth. In the introduction, the authors explain that the book "is not about science per se. It's about us and what we as a species need to do, now that we understand for the first time where we are in time and space." Primack and Abrams will give a multimedia presentation based on their new book on Monday, April 4, at the California Academy of Sciences in San Francisco. In this talk, they will explain modern cosmology using stunning astronomical videos and relate it to life on Earth, suggesting ways of understanding global issues in their cosmic context. Additional information and tickets for the talk are available online. The New Universe and the Human Future builds on ideas first presented in an earlier book by Abrams and Primack, The View from the Center of the Universe. The pair has co-taught a popular course called "Cosmology and Culture" at UCSC for more than a decade. A leading cosmologist, Primack is one of the principal creators of the modern theory of the universe on the grand scale. Abrams, an attorney, cultural philosopher, and lecturer at UCSC, has worked for the Ford Foundation and the Office of Technology Assessment of the U.S. Congress. Praise for their new book comes from diverse sources, including Archbishop Desmond Tutu, Nobel Peace laureate, who said, "Abrams and Primack show us how the strange and newly discovered nature of our universe can empower us to meet the gravest challenges of our time." Lord Martin Rees, Astronomer Royal and former president of the Royal Society, said, "Joel Primack is a pioneer of modern ideas of cosmic evolution, superbly qualified to write with Nancy Abrams an original synthesis and distinctive perspective on humanity's place in the cosmos." A companion web site for the book includes remarkable images and videos relevant to specific chapters. Many of the videos are based on supercomputer simulations of key aspects of the evolving universe, including videos based on Primack's research on the role of dark matter in the evolution of structure in the universe.